Eliminate Stubborn Belly Fat by Discovering the Secrets to Safe and Permanent Weight Loss……so you can Easily Lose Weight and Stop Yo-Yo Dieting. Are you frustrated and overwhelmed with all of the hype and often misinformation and unrealistic promises of the latest fad diets? Are you feeling defeated by your weight loss efforts? Do you long for an easy way to stop yo-yo dieting? Have you put your hopes and dreams of looking better and feeling better on the back burner? Maybe you feel stuck, or you hit a plateau with your weight loss. Have you tried your best but you’re still not experiencing the results you’d hoped for? Do you feel like you’ve wasted months or even years and haven’t reached the results you so earnestly desire? If you can relate to this then you have a friend in me. I don’t want the discouragement of previously failed weight loss efforts to stop you from getting the weight loss results you desire. I have the knowledge and know how to help you. 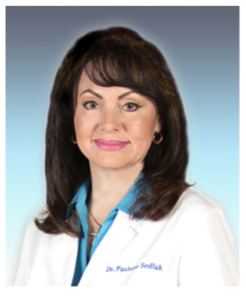 Hello, I’m Dr. Paulette Sedlak. 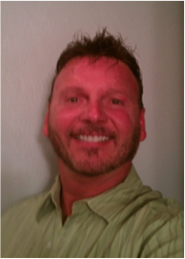 I’m a Chiropractor and a board certified nutritionist with a Master’s Degree in nutritional biochemistry. I’ve been working in the field of nutrition for over thirty years. I’ve had the privilege to help thousands of people attain and maintain their weight loss and health goals over these years. I’m very passionate about helping people who struggle with constant dieting and therefore failed weight loss. It is a very big deal to be at your right weight. The health risks and complications of being overweight (especially in the belly area) include type 2 diabetes, heart disease, high blood pressure, stroke, and many types of cancers including breast cancer. An overweight condition negatively affects every aspect of your life. Many people have told me it affects everything from the board room to the bedroom. The effects of extra pounds in lowering your self-esteem and confidence can prevent you from doing things you want to do in life and becoming the person you want to be. I know first-hand how the extra weight makes you feel. A funny thing happened to me in the last two years. I don’t mean funny ha ha. I mean funny like hmmm . . . very interesting. After thirty years in practice I decided it was time to sell my clinic. I know I was spiritually led to make this life altering decision. It’s given me the time to write my first book, The Happy Healthy Dieter, and create this amazing weight loss program, The Belly Fat Solution. What’s funny is I had no intention on writing this particular book and developing this specific program. I knew I wanted to create information that would help people lose weight and support disease prevention. However, initially the reason I created this book and program was because I was on a mission for myself. You see as soon as I sold my clinic I began to gain weight in my mid-section. I want you to understand I’ve always been very good with helping people lose a lot of weight. What I didn’t specialize in was losing the last ten pounds. Believe me losing stubborn belly fat requires a totally different nutritional strategy. Although I was still in a good weight range, I was determined to find the missing keys to getting rid of stubborn belly fat that creeps up as you age. Guess what happened. I did it! I cracked the code! I created a four part system that cracks the code of getting rid of belly fat once and for all! What’s so great about this is that the four part system works if you want to lose your first ten pounds or your last ten pounds. Woohoo! It is highly predictable that anyone who follows the step-by-step system I’ve created will lose belly fat and the weight they want to lose once and for all. Through much research and clinical trials I have put together my insider secrets of conquering belly fat permanently. Having implemented these discoveries in my own life, I have plenty of energy, and now have the confidence I need to go forward in life. I’ve seen these same amazing results reproduced in my patients and I’m constantly overjoyed for them. When they look at me and say, some with tears in their eyes, “thank-you, thank you Dr. Sedlak, I didn’t think it was possible,” I understand. »Agonize over volumes of diet information trying to do it alone. »Stay stuck with a poor body image because of your weight. I’ll show you how to end the confusion and learn how you can create a flatter belly and achieve permanent weight loss results. If you’re fed up with dieting and tired of trying to fit into and look good in your clothes, you’re going to love the 3 week solution I created that has cracked the code for stubborn belly fat loss. Finally ….. a lasting solution that terminates yo-yo dieting. Now you can lose the weight and keep it off. You can gain the confidence and energy you need to do what you were meant to do in your life! Your about to discover secrets most people will never know concerning the achievement of permanent weight loss. The insider secrets you need to stop dieting once and for all are all contained In “The Belly Fat Solution”. If these are your issues, you are in the right place. I’m here to help you change all of that. That’s right. Help has arrived! Now is your time to start becoming the best you can be. Starting today you can begin to make, feel and see a difference in your weight, energy, and waistline by following this four part formula for successful weight loss. It is the missing link to permanent weight loss and eliminating stubborn belly fat. Cause your body to become efficient at functioning with fewer calories making it nearly impossible to lose weight in the future. Create an efficiency level that causes weight gain quickly once you begin to eat normally. Compromise your immune system which can lower your resistance to disease. Cause the weight you lose to be mostly water and muscle not fat. All these effects put you on the path to endless yo-yo dieting. My Program will provide tools you need to get rid of your belly fat without starving yourself to lose the weight. This program is the solution to stop yo-yo dieting forever. This program contains the essentials you need to overcome stubborn belly fat, weight loss and yo-yo dieting. You will have immediate access to receive the following information as soon as you obtain this program. The strategies to overcome sugar and carbohydrate cravings. Let’s face it; if you don’t conquer your sugar and carbohydrate cravings, you won’t adhere to a plan for very long. I’ll show you how you can easily overcome the cravings with specific strategies that will trick your body. It’s easier than you think when you know the secrets. The correct balanced nutrition information that will create a healthier you as you lose weight. Losing mostly fat pounds and not muscle and water weight. The more muscle you have on your body, the easier it is to continue losing weight. This is a major key to setting your body on fat burning auto-pilot. Maximizing your nutrition as you lose weight. This will help you have more energy to enjoy life and do the things you were meant to do. Balancing the two most important hormones for weight loss, fat burning, and decreasing dangerous belly fat. Those hormones are insulin and growth hormone. This balance is crucial to keeping the weight off. The right training and tools to support your day to day actions that will ensure your permanent weight loss success. I’ve included a complete step-by-step guide complete with a checklist, menus, food list, and a summary sheet to keep you on track. A food plan that creates satiety. Satiety means satisfied. You will feel satisfied and not hungry because your body won’t feel like it is on a diet. If you constantly feel hungry and deprived, you will never stay on a diet plan. A major portion of creating healthy satiety is using the correct nutrition to support effects that stress may have on your body, your mood, and specific hormones. Inner preparation + outer preparation = Total preparation for weight loss success- I’ll show you exactly what to do to establish a solid foundation for permanent weight loss. This is the number one overlooked strategy for permanent weight loss that ensures success. Without a solid foundation the house crumbles. I lost 22 pounds in 4 weeks by eating the real food that I love. So many times I quit a diet because I didn’t know how to organize my meal planning for weight loss. This caused me to be overly hungry when it was meal time because I had nothing prepared. I learned through the Preparation Phase of Dr. Sedlak’s program exactly which foods I needed to keep in my pantry and refrigerator. I found out what I needed to do to have a meal preparation plan in place so I wouldn’t grab the first junk food I saw. Now, I follow the preparation guide she provided to keep me on track. Everyone would benefit from having this type of checklist to stay on track. By the way my dad did the program with me and lost 45 pounds in 6 months. There are specific foods you need to eat to boost your metabolism. The trick is knowing which foods to eat to stay full while you’re losing weight and when to eat specific foods. Also, eating certain so called “health foods” can actually be keeping your weight on. Worst of all they can be making you sick. Sarah can be a SUPER MOM again! Balancing hormones – you must balance insulin and growth hormone to prevent dangerous belly fat and stop weight gain. I’ll show you how you can make these hormones work for you as you age instead of against you for permanent weight loss. I lost 16 pounds in 4 weeks! 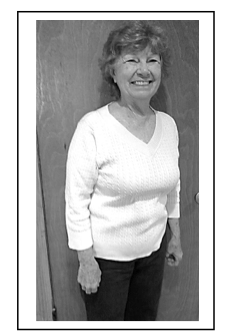 Ruth is in her seventies and is a very active great grandmother. She thought like most people do about dieting. That is, it is very difficult to lose weight as you age and you probably have to starve yourself to lose the pounds that crept up in the last few years. Ruth said “I didn’t know you could eat more food and lose weight. The trick is to know when to eat specific foods and what time of the day to eat certain food groups so you can lose weight and not be hungry. I ate the foods that kept me feeling full and followed Dr. Sedlak’s step-by-step formula that explains exactly what to eat and when to eat it. Timing is everything when it comes to decreasing the fat storing hormones. I lost 7 pounds the first week without feeling hungry!! I now have the energy to keep up with my great grandchildren. At my age most of my friends are slowing down but now I don’t have to. I feel better than I did 20 years ago! It’s amazing! The formula for satiety – when your body feels satisfied, you will naturally stop eating. Creating proper satiety is the key to overcoming cravings and stopping the overeating cycle. If you are on a plan that keeps you satisfied and feeling full, weight loss is inevitable. This will create your defense against gaining the pounds back. These 4 parts are essential to cause lasting weight loss results. They are built into the ‘almost magical formula’ I’ve created for you. This formula is built around creating satiety while balancing insulin and growth hormone for fat burning. You’ll receive step – by – step instructions on exactly how to follow the eating plan. All the guess work is taken out for you. The program takes all of the guesswork out of dieting. It includes the tools you need to for your weight loss success. All of these provided tools will make it easy for you to stay on track until you arrive at your desired weight range. You can follow the menu or create your own from the information that I’ve included. How to continue to lose stubborn belly fat without hunger, and much, more. I know people who have spent decades trying to lose weight and thousands of dollars trying dangerous fad diets. Many people spend thousands of dollars just trying to balance their hormones and prevent diabetes. You may think now is not the right time. Now is the best time. For your sake, I want you to stop wasting precious time and energy and start enjoying life with self-confidence because you feel great on the inside and look great on the outside. Many people set a goal but don’t achieve their goals. I don’t want this to happen to you. You need a step-by-step plan with proven strategies. This is what I’ve developed for you. Human nature is a funny thing. For some reason we look for ways to delay our decisions even if the decisions would result in our benefit. The biggest favor you can do for yourself right now is to make a decision. Don’t let this be one more thing you need to think about. Nothing will keep you from your dreams faster than delaying decisions. If this resonates with you, then it is a yes. Either way trust your decision and move forward. You are going to learn how to stop starving yourself to lose weight and flatten your belly and learn how you can eat delicious foods that rapidly melt the pounds off. I believe in you. I know you want to look your best and feel your best so you can enjoy life the way it was meant to be. This program will break you free from the frustration of constantly dieting. The cost of having the extra pounds goes far beyond how it makes you look. The emotional problems are immeasurable, the low self-esteem and lack of confidence can cost many lost opportunities over a lifetime. The health risks and complications of being overweight include type 2 diabetes, heart disease, high blood pressure, strokes, and many types of cancer including breast cancer. It is a very big deal that you do not put off your decision to make a difference in your health by losing the weight now. This program can change your life! Paul Z. 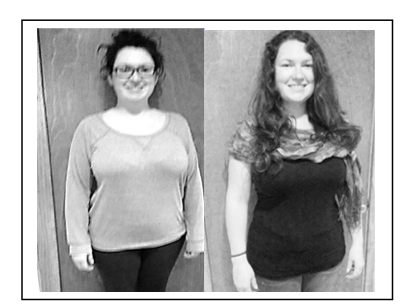 – 30 Pounds lost and no more medicines! l lost 30 lbs. in 3 months and kept it off! I now have a flat belly! The best part is what my doctor told me on my next visit. He said I no longer needed to take medication for high blood pressure and high cholesterol and to continue doing whatever I have been doing. I’m thrilled I no longer need the medicines! 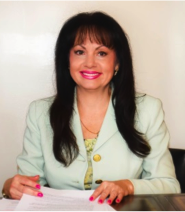 Dr. Sedlak’s program has enabled me to have the energy and enthusiasm to enjoy life more than ever! Once you see how easily you can master the concepts in “The Belly Fat Solution Program”, you will soon see your confidence escalate. You will feel better about yourself and begin to conquer any self-doubt you previously had about reaching your weight loss goal. Once you start to see your belly flattening in the first week amazing things happen. It causes an emotional-mental shift that creates awareness for you that you can overcome the dieting battle. It’s very exciting! Many weight loss programs are unsafe and can ruin your metabolism which can make it more difficult to lose. Now is the time to make the difference in your health so you can truly express who you were meant to be. Inner Preparation Mind Secrets – I’m very excited about you having this bonus! If your thoughts and emotions aren’t in check, your foundation for weight loss will soon crumble. This guide is so powerful; it can actually change every area of your life. Five Drinks That Will Keep You Feeling Full and Won’t Pack on the Pounds – These drinks were my go to drinks that helped me bust out of the craving mode. 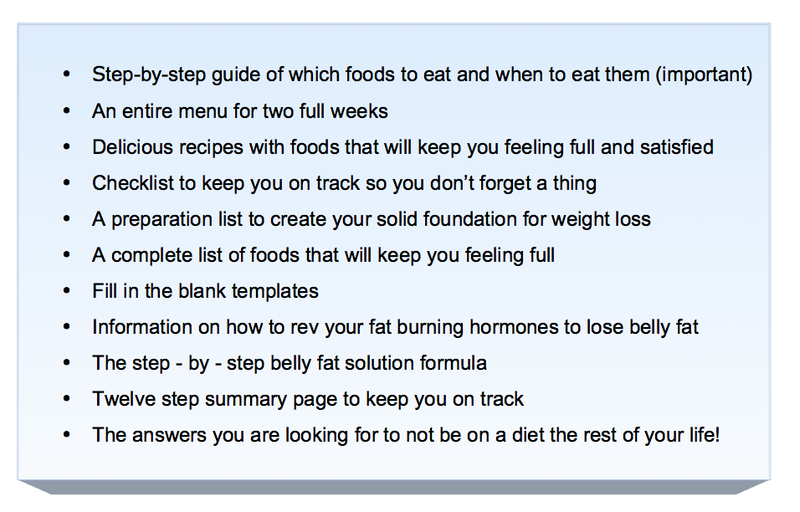 Twelve Step Summary – This is the bottom-line cliff note version of the Belly Fat Solution Formula. Keep this handy summary on your refrigerator for easy access to keep you on track. SUPER BONUS Video – Flat Belly for Life – I want you to lose your belly AND have your greatest abs ever. That’s why I brought a leading expert aboard who has her doctorate degree in physical therapy and has won several fitness competitions. Kim Metzger will show you exactly how to change the appearance of your belly as you lose the weight so you can have your best looking abs. This information is gold if you want to tighten your abs as you lose your belly fat to create the leanest look. Listen to this quick video interview I recorded with Kim. She explains exactly what you should do to create your flat belly for life. This program is safe and highly recommended for you if you are pre-diabetic, diabetic, have high cholesterol or high blood fats, heart disease or cancer. The program is about maximizing your health potential as you lose weight. There is no other program like it. It’s so important that you don’t wait. Haven’t you waited long enough for the right answers to lose dangerous belly fat and have permanent weight loss results? I know you want to be the best you can be for yourself and your loved ones. I also want that for you. You are truly a one of a kind person. You do matter. You matter to me. I know you can do it.